All SKUs will be available for pre-order and purchase through rightstuf.com and Aniplex ‘s official retailers (Aniplexusa.com/retailers) from May 28th. Each of the Limited Edition Blu-ray Box Sets will come with tons of bonus materials including Original Soundtrack CD (Vol.1 & 3) or Bonus DVD of English cast interviews (Vol.2 & 4), a deluxe 16 page booklet, illustration pin-ups as well as exclusive collectible card from Bushiroad. 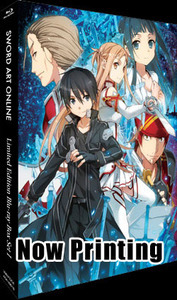 In addition, bonus contents on each Blu-ray discs will include audio commentary by creators and Japanese cast, Special Animation “Sword Art OFFline”, and more. The Box Set will also feature an exclusive rigid box illustrated by abec (Original Character Design), and clear BD Cases with double-sided Japanese cover design. Both Blu-ray and DVD will have Japanese and English dialog, English subtitles as well as Spanish subtitles. Limited Edition Box Sets will be available while supplies last. Sword Art Online is an anime adaptation of one of the most popular light-novel series (Dengeki Bunko / ASCII MDIA WORKS) written by author Reki Kawahara . The story is set in a not-so-distant future where people are able to play video games more realistically with the emergence of the NerveGear, a virtual reality generating device, which the players wear to stimulate their senses to control their avatars in the world of the game. Kirito is an experienced player who was excited for the release of the new Virtual Reality Massive Multiplayer Online Role-Playing Game (VRMMORPG), Sword Art Online , a.k.a. SAO . But, when Kirito and all the other players logged on to SAO for the first time, they quickly realized that something was not right. The creator of the game, Akihiko Kayaba, reveals to them that they will not be able to leave the game world unless they defeat the final boss atop a tower that is 100 floors high! To make things worse, Kayaba informs them that if a player dies in the game, he or she will also die in the real world. Now Kirito must fight along with players to defeat the boss and free everyone from Kayaba’s dreadful ploy. Kirito and his friends will soon learn that Sword Art Online is more than just a game.